Largo, Florida is home to almost 80,000 happy people and is located in Pinellas County. It’s a nicely sized town but you are still close to bigger cities like Tampa. Visitors enjoy going to our Armed Forcces History Museum or The Florida Botannical Gardens. Largo has amazing weather, tropical landscapes and is located close to many gorgeous beaches. If you own a home or rent a property in Largo, you know how important it is to feed and care for your trees, shrubs and lawn. Largo gets a large amount of rain each year. To be exact, its 52 inches of rain. Because of this, you should monitor your lawn closely. You must make sure it’s not getting too much water and that irrigation is working properly. There can also be times when Largo is short on water. During these times, Largo’s water use restrictions should be obeyed since it affects everyone in the area. 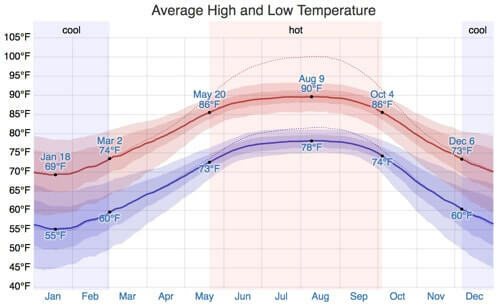 Temperatures can reach up to 90 degrees in the summer and have the ability to drop down to 55 degrees on some winter nights. Because of this, it’s very important to take the proper precautions in caring for your landscape. There are several lawn types that grow in Largo. 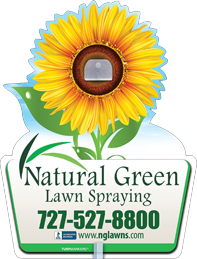 At Natural Green Lawn Spraying, we know how to treat all of them properly! How Much Does Lawn Fertilization Cost in Largo? The average consumer in Largo pays $116/mo just for fertilizing services. This does not include treating your lawn for diseases, insects or preventing weed growth. You can see the pricing details in the table below. Natural Green’s monthly lawn plan includes fertilization, pest control, weed control and disease prevention. What’s even better is we make sure your lawn is still safe for your children and pets! Pricing depends on many factors so why not set up a free lawn analysis with us today?